Light and sweet, this salad brings a nice balance to my life after eating all of the indulgences of the season. I just can't seem to get away from the riches calling my name at every corner. January I promise myself, is the time where I will be reborn into the health Goddess I know am. For now, I might as well be living in Sodom and Gomorrah. The temptations I face are pulling me in and I am weak! I am lured all to easily now that I've given in to sugar once. My protective wall has disintegrated and I am falling prey again. And again. AND again. Oh I did good for the first two months without sugar. But now I am a failure. To weak to conjure the energy to stick to my guns. January I vow, will be my month of redemption. At least that's what I am telling myself. Resolving to find some balance I whipped up a salad for lunch. With the first bite I was swallowed up by its vortex of sweet tangy sauce and crisp juicy apples. The green and righteous flavor of the spinach and arugula embraced me with it's healthy touch. Naturally it harmonized the taste of sweet and green, juicy and crisp,  cheesy and healthy. To heck with my fork I thought, I wanted to eat this with my fingers. I picked up a piece and casually tossed it into my mouth. Heaven! As the juicy dressing dripped down my fingers, my tongue reached out in rescue, blissfully licking it off. If a salad can taste this good who needs to indulge in the riches of the season? -Place the frozen berries in the microwave and defrost for 30 seconds to a minute. Once thawed mash with a fork. -Place all ingredients including the mashed berries into a jar and mix well. 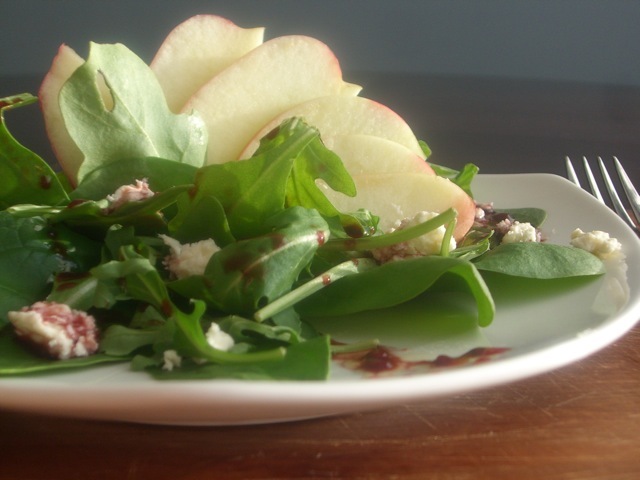 -Arrange Spinach and arugula in a large salad bowl. Add two thirds of the remaining ingredients (reserving the last third for garnish) and toss together. Drizzle the salad dressing in a circular motion over top. Garnish with the remaining ingredients.